Does My BD-F5100 Support A Wireless Network Connection? IMPORTANT: This player does not support a wireless network connection nor does it support a wireless adapter, an Ethernet network connection is supported. 1. Connect one end of the Ethernet cable to the back of your router or modem. 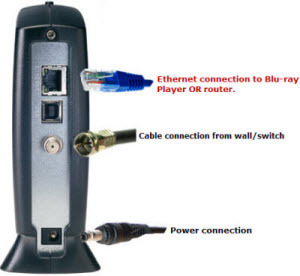 • If connecting the Ethernet cable to a modem, be sure the Ethernet cable is inserted in the Ethernet port. • If connecting the Ethernet cable to a router, be sure the router is connected to a modem and is receiving a network connection. 2. Connect the other end of the Ethernet cable to the back of the player. 3. Power on your player and wait for the Home menu to display. 4. 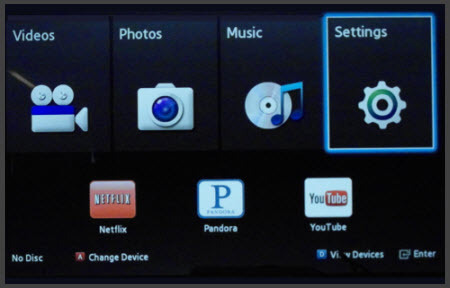 Using the top arrow button on your Blu-ray remote move to the top row of options on the home menu. 5. Using the right or left arrow buttons move to Settings and then press enter. 6. Using the top or bottom arrow buttons move to Network and then press enter. 7. Using the bottom arrow buttons move to Network Status and then press enter. The player then displays the current network status. 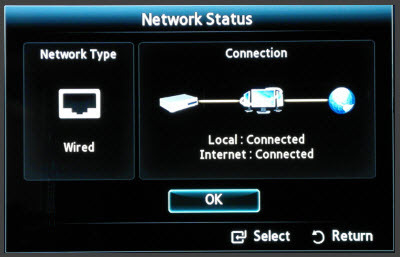 • If Local is connected but Internet is not connected, power off the player, and power off the router and/or modem. After about 30 seconds power on your modem and wait for it to connect, power on your router and wait for it to connect, and finally power on your player. Go to Network status to verify connection. It make take about 30-45 seconds for the player to establish a network connection. 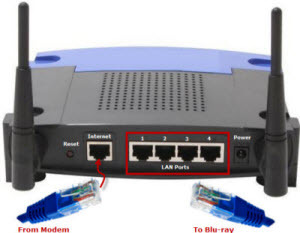 • If the connection still fails, verify the Ethernet cable is connected to an active port on the router and/or modem. See image above. • Try another Ethernet cable and make sure the end of the cable is firmly inserted into both the player and router/modem port. 1. Using the top arrow move to the top row of the Home Menu. 2. Using the right or left arrow buttons move to Settings and then press enter. 3. Using the bottom or top arrow buttons move to Network and then press enter. 4. Using the bottom arrow buttons move to Network test and then press enter. Press Exit once to return to the previous menu, press exit again to return to the Home Menu. • If the Network test fails the MAC Address, and only zeros are listed, your player requires service. Click the online service request below to begin service setup. • If the Network test fails the IP Address, Gateway Ping, or the Internet service test, the problem is not with your player. Power cycle your modem and/or router and then follow steps 1-7 above. When powering on your modem and/or router be sure to wait for each to connect to the internet, this normally takes about 1-2 minutes.